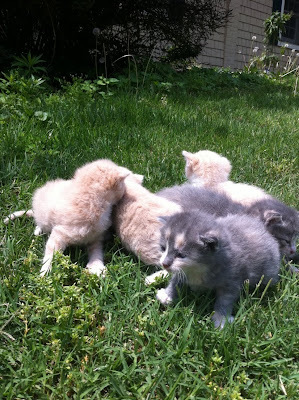 PC's Blog: As promised HOUSE OF NIGHT KITTENS! As promised HOUSE OF NIGHT KITTENS! So out here at Rancho Cast we've had coyote/owl issues. Tragically I've lost three out of five cats, one the mighty Patchy Poo the Pud who was fifteen glorious years old and my favorite cat in the universe. I hope he gets tired of frolicking with the Goddess and decides to return reborn to terrorize Kristin for another fifteen years! Here's the litter! With mom shortly after they were born, and today. Adorable! p.s. Reminder: be a responsible pet owner. Spay or neuter your animals! Your cats are really cute! My cat got babies two yrs ago, too. Oooh so cute! I love cats i have two named Hoopy and Bumble. These kittens are soo cute! I've always wanted a orange and white kitten! I have a 8 month old kitten named Socks and I love him, but hes not orange and white oh well. Maybe one day I'll get him a friend. I agree, people who have pets should take proper care of them and spay and neuter them! People shouldn't leave their pets randomly either. Who can even do that? I couldn't. Soo, I just started reading Divine by Mistake and I'm like on page 130 or something but I'm already in love with the book. It's hilarious! I love the humorous side of Shannon! Anyway, Happy writing! Anymore Divine books after Divine Beginnings?? oh my gosh they're the cutest things EVER! Kittens are such adorable animals. :D :D I used to have a cat named anubis but he passed. My birdie mose is the only one left. lol He's an albino cockatiel. Beautiful bird. OMG!!! They are sooo cute! I love kittens! 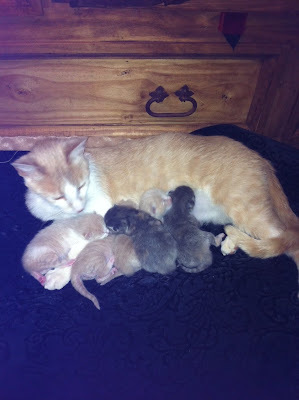 I haven't had a kitten in about 10 years :( I have 5 cats, Nala, Princess, Blacky, Fluffy, and Shadow. Christina - yep, Elphame's Choice and Brighid's Quest are both set in Partholon. Shannon (and the events of Divine by Mistake, Choice, and Blood) are in the past. Elphame is a relative of Shannon's. Enjoy! I'm so sorry for your loss, because I know how much animals enlighten our everyday life. My big kitty Carmilla is everything to me. I have a question: I'm french, so I don't exactly understand the meaning of "Patchy Poo the Pud" (I understand Patchy, but the not the whole name). Naming the kittens after your House of night series: cool!! I agree with ChristinaCarol: Shannon is such a great character! Bonjour Geraldine! That's a good question. Poo is just a pet name and doesn't really mean anything, like "kissy poo." Pud is short kind of an American slang term for cat. Glad you like Shannon. I love the Partholon books! Thanks for answering: it will improve my vocabulary!! And yes, I love Shannon (and Clan Fintan!!). Now I will begin your House of Night series, I just bought the first four books! Those kittens are soooo cute! I'm not normally one for cats but those little babies are to die for!!! I want a HoN kitten! They are so beautiful. I love cats! I know you posted this blog last month, but my question has to do with a cat in HoN, so I thought this particular blog would be the perfect place to ask. I just finished Hunted and in it, a cat named Guinevere was briefly mentioned. Did you get that name from the song "Guinevere" by Eli Young Band? I know that's a random question, but I had never heard the name until I heard that song. I'm loving the HoN series! Megan - Guinevere is named after King Arthur's queen. 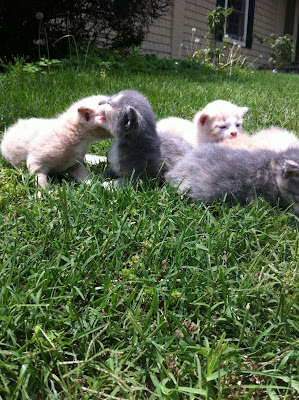 I love love love kittens that and puppyies and wolf cubs I am an all around person when it comes to that. Book giveaway for DRAGON'S OATH!